The site consists of four large groups of stone circles that represent an extraordinary concentration of over 1,000 monuments in a band 100 km wide along some 350 km of the River Gambia. The four groups, Sine Ngayène, Wanar, Wassu and Kerbatch, cover 93 stone circles and numerous tumuli, burial mounds, some of which have been excavated to reveal material that suggest dates between 3rd century BC and 16th century AD. Together the stone circles of laterite pillars and their associated burial mounds present a vast sacred landscape created over more than 1,500 years. It reflects a prosperous, highly organized and lasting society. 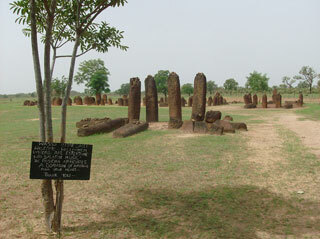 This article uses material from UNESCO World Heritage List article "Senegambian stone circles", which is released under the Creative Commons Attribution-Share-Alike 3.0 IGO License.